Little did I know that one of the most famous Jesuits, St. Francis Borgia, had considered the same question in the same country more than 400 years ago. Whereas my professor brought the question to my attention in conversation, the question came to St. Francis Borgia through a shocking experience, which the painting above demonstrates in vivid detail. Francis was a member of the high nobility: one of his close relatives was the Pope and his great grandfather was the King Ferdinand who sent Columbus across the Atlantic Ocean. Francis’ personal title was the Duke of Gandia. In 1539 Empress Isabella of the Holy Roman Empire passed away very prematurely. All of Europe knew her to be a stunningly gorgeous young lady, but death unexpectedly snatched away her riches, her fame, and her beauty. 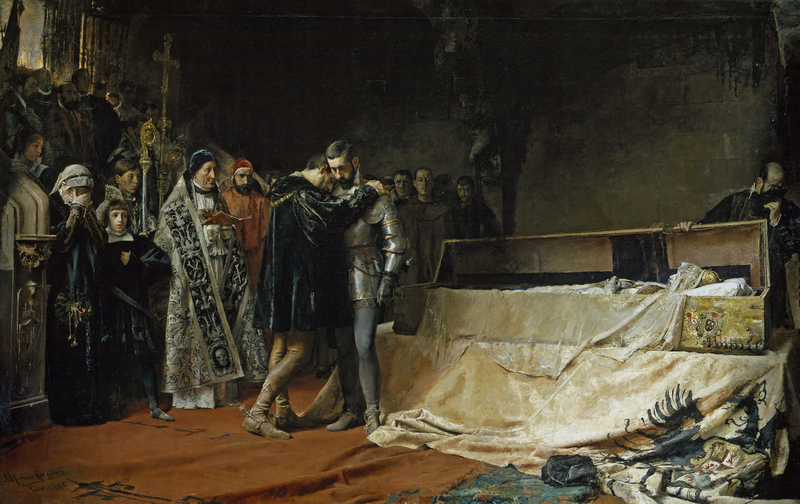 As Francis Borgia was close to the Emperor’s family, the authorities chose him to be the one who would confirm that the body inside the casket was in fact the body of Isabella before she would be interred. When the lid on the casket was lifted, all who looked upon the corpse inside were taken aback by the decay that had already occurred. Some report that Francis stared at the face of the former empress for several minutes while every one else turned away. Others say that Francis, as portrayed in the painting above, was so disgusted that he grabbed the shoulders of one of his knights to avoid falling to the floor in faint. Either way, the event had a powerful effect on Francis’ life. He allegedly acclaimed to those who were gathered, “This death which has thus treated the imperial diadem, has already leveled his bow to strike me. Is it not prudent to prevent its stroke, by dying now to the world, that at my death I may live to God?” Francis made plans to give up his wealth, which was substantial, and to enter religious life in the Catholic Church. As soon as his wife passed away, he set aside some money for his children, and he entered the Society of Jesus, the order to which I belong. Eventually, he became the third superior general of the Jesuits. When my professor had asked me the question about death, my response was very different. In a moment of pure arrogance, I said, “I do not think that I will die.” I responded this way because I was afraid of death and because I figured that it was a moment far away. However, little by little, I came to see, as St. Francis Borgia did, that there is no reason to fear death if we prepare ourselves to meet Christ. A life that pursues fame, riches, and beauty will ultimately lead to ruin, as it had for the Empress, yet a life that seeks humility in Christ will find that hardship and death are only the first half of the story. And who, after all, likes a story that does not contain a struggle between hope and fear? Reminder that we live for Christ not ourselves.